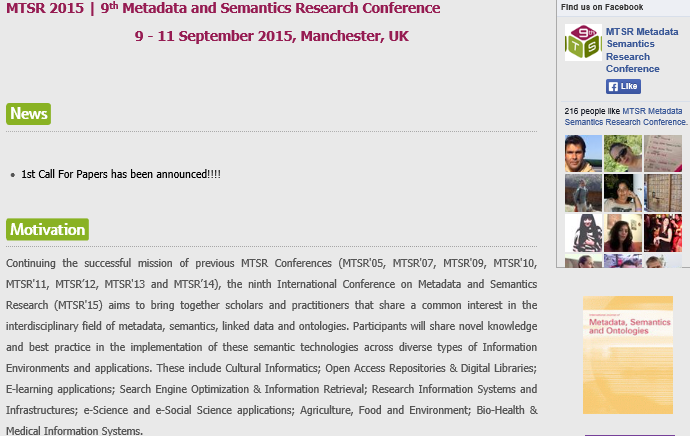 The 9th Metadata and Semantics Research Conference has recently announced its call for papers, which is also available as a PDF document. Metadata has been a area of interest to UKOLN, my former organisation and Cetis, my current organisation, also have interests in this area including recent support for LRMI, the Learning Resource Metadata Initiative. the ninth International Conference on Metadata and Semantics Research (MTSR’15) aims to bring together scholars and practitioners that share a common interest in the interdisciplinary field of metadata, semantics, linked data and ontologies. Participants will share novel knowledge and best practice in the implementation of these semantic technologies across diverse types of Information Environments and applications. These include Cultural Informatics; Open Access Repositories & Digital Libraries; E-learning applications; Search Engine Optimization & Information Retrieval; Research Information Systems and Infrastructures; e-Science and e-Social Science applications; Agriculture, Food and Environment; Bio-Health & Medical Information Systems. The deadline for submission is 9th May and authors will be notified of acceptance or rejection of their submission on 16th June. In a post on his OUseful blog over a year ago Tony Hirst described the “What did you notice for the first time today?” exercise which he used in a workshop on Future Technologies and Their Applications which Tony and I co-facilitated at the ILI 2013 conference. Tony describe how this approach could be important for trend spotting: “it may signify that something is becoming mainstream that you hadn’t appreciated before“. However I found that trying to reflect on something I’ve notice for the first time today too constraining, so I proposed a tweaked version: What Have You Noticed Recently? However another variant may be “What have you noticed is now a mainstream practice which may have been considered inappropriate in the recent past?“: this might be particularly useful in identifying acceptance of emerging practices and a willingness to accept some level of risk. 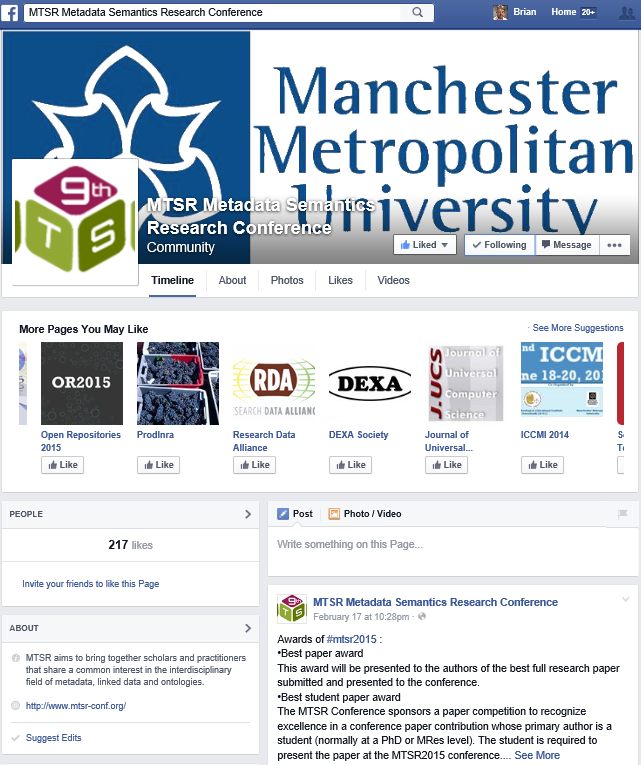 This came to me when I notice that, as shown in the image at the top of this post, the MTSR 2015 conference home page provides details of the MTSR Metadata Semantics Research Conference Facebook page. The Facebook page, which currently has 217 ‘likes’, contains a small number of updates: the launch of the Facebook page, the first announcement of the call for papers, an update to the page’s photograph, details of the conference Twitter account, dates for the call for papers and award details. In addition to this content (which are primarily links to content hosted on the conference web site) as can be seen from the screen shot the Facebook page also provides links to Facebook pages for related content including Open Repositories 2015 (283 likes including 3 researchers/librarians I am connected with), the Research Data Alliance (363 likes) and ICCMI 2014 (309 likes). In answer to the question I posed “What have you noticed is now a mainstream practice which may have been considered inappropriate in the recent past?” I can answer “Use of Facebook to promote research conference and apparent ‘liking’ of the page by hundreds of researchers and practitioners“. Or, to generalise this “An acceptance of the risks of using Facebook by well-educated researchers and library practitioners and an acknowledgement of the benefits which can be gained“. 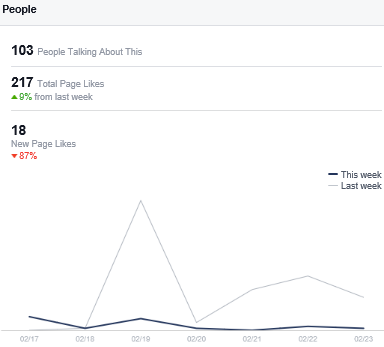 The use of Facebook to promote research conferences seems to no longer be one of “should we?” but instead one based on a cost-benefit analysis – can the effort in updating a Facebook page for a conference be justified? Fortunately the Facebook statistics for the page provides usage data for helping to answer this question (it should also be noted, incidentally, that the conference’s MTSR 2015 Twitter account currently only has 9 followers). Would you agree that this is now a mainstream practice? Would you also agree that in the past this type of use was frowned upon? This entry was posted on 24 Feb 2015 at 10:00 am	and is filed under Events, Evidence, Facebook. You can follow any responses to this entry through the RSS 2.0 feed. You can leave a response, or trackback from your own site.